The Barbados weather forecast is a little better than the typical weather forecast of the Southern Caribbean islands. Most of the days carry plenty of sun and warmth during the day, with cool breezy nights that allow you to snuggle next to that loved one for walks on the beautiful beaches. 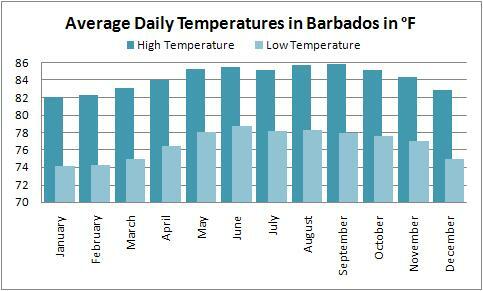 The daytime Barbados forecast calls for an average temperature between 75°F (24°C) and 80°F (26.6°C) all year (see chart below). The temperature in Barbados is kept cool relative to other Southern Caribbean islands by trade winds that blow in almost constantly from the east to welcome you to the island. On average, you will see 8 to 10 hours of sunshine between November in March, and 8 to 9 hours during the rest of the year. This leaves plenty of time for excursions, activities and sun bathing! Wet weather in Barbados is primarily from June through November, when the Caribbean islands are in hurricane season. However, Barbados has the luxury of being relatively hurricane free, and, like most showers in the Caribbean, they are quick and serve to cool things slightly before the bright sun reappears. Weather in Barbados is interrupted for hurricanes (brushed or direct hit) only once every 3 years; however, they only see a direct hit once every 27 years. In the last 137 years, Barbados was invaded by a hurricane passing within 60 miles only 45 times. The last was a brush with Hurricane Dean in 2007. Hurricanes typically bounce from land mass to land mass, and because it is relatively isolated from the rest of the Caribbean islands (Barbados is the easternmost of the Caribbean islands, situated on the very edge of the Atlantic Ocean), hurricanes tend to drift 100 miles or so north of the island and Barbados weather remains mostly free of the massive storms. Simply put, there are very few islands with better weather than that in the Barbados weather forecast!